Jack’s observation, and view, was shared by other industry experts over the four days of CEPSI 2016 which ran from October 23 – 26. CEPSI is recognized as one of the leading sector “think tank” summits in the region attracting 1,500 participants, from more the 40 countries, this year. 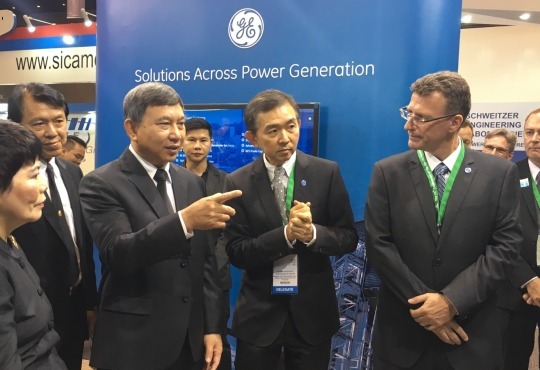 GE Thailand CEO & President, Kovit Kantapasara (center) hosted Thailand’s Deputy Prime Minister, Air Chief Marshal Prajin Juntong (left), along with other senior Ministry of Energy officials at the GE booth. Asia Pacific (AP) is one of the most dynamic energy regions in the world with demand projected to double by 2030, and more than five trillion dollars tipped to be invested to support new power generation over the next 25 years. Many opportunities, and challenges, faced by AP energy players were discussed during CEPSI 2016. Topics ranged from mega-trends covering urbanization, climate change, population growth, and rising demand for energy, to industry-focused issues such as new business models for utility providers, digital-industrial offerings like digital grid, substation, and virtual power plant innovations, as well as advances in smart meters, storage batteries, grid developments (micro grids, global super grids), and more. Greg Guthridge, managing director, Asia Pacific Utilities, Accenture also spoke about empowered energy customers of the future and new consumer categories including “Prosumers” interested in solar and battery storage options, “Set and Forget” customers who will pay a premium for automated solutions, and “Energy Diverse” consumers who want a bundle of energy products and services. Given GE’s long history of developing energy projects throughout the region, experts from the company’s Energy Connections, Power Services, and Power businesses participated in keynote presentations, panel discussions, and technical sessions. They shared GE’s digital industrial innovations to modernize the grid, as well as advances in intelligent digital substations, new technologies to produce smarter, cleaner steam power, and more. GE’s Head of Performance Calculation and Testing Department, Steam Power Systems, Dr Olivier Le Galudec said his “Power Plant Digital Twin” presentation generated a lot of questions. He said the enthusiasm of the audience, and feedback from executives met, reinforced his view that Asia Pacific is one of the most exciting energy markets in the world. This view was shared by Jack Wen. Other GE speakers highlighted GE’s cyber security innovations for the industrial internet as well as the full scope of gas power plant solutions from mobile power plants to complete turnkey offerings. GE solutions were also showcased interactively at an exhibition booth highlighting GE expertise in Steam Power Services, Gas Services and Grid Connections. The award for “Best Paper” of the conference was presented to GE scientist, Douglas Wilson (right) by Kornrasit Pakchotanon, the Governor of the Electricity Generating Authority of Thailand. 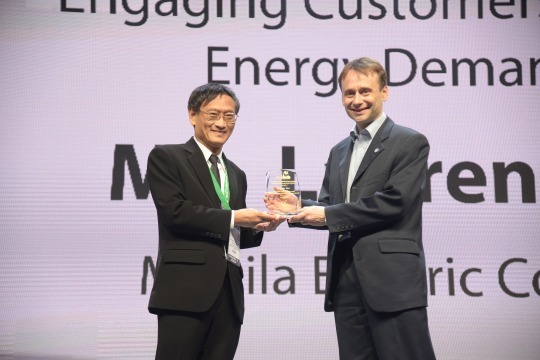 GE research was also recognized, and honored, when Douglas Wilson, Chief Scientist, WAMS, GE Energy Connection received the CEPSI “Best Paper” accolade at the closing ceremony. The paper, written with co-authors in GE, SP Energy Networks, National Grid and academic partners in the UK, describes innovative wide area monitoring and control solutions for managing grid stability. GE’s recent advances in synchrophasor-based solutions for the grid in Great Britain, address oscillations, disturbances, and fast response wide area defense measures, as renewable generation increases. Conference reports from ASEAN described similar challenges that could be met by GE’s wide area monitoring and control platforms – given this, the exchange of experience at CEPSI is a good “first step” to approach ASEAN utilities facing the same issues.